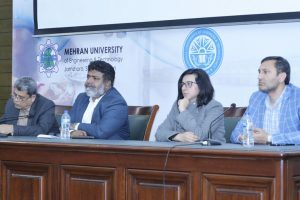 An executive seminar on ‘Water Governance in Pakistan’ was organized by the U.S-Pakistan Center for Advanced Studies in Water (USPCAS-W), as a collaboration between Mehran University of Engineering & Technology (MUET), Jamshoro and the University of Utah, USA. The U.S.-Pakistan Centers for Advanced Studies (USPCAS) have been designed to support Pakistan’s economic development by strengthening universities and encouraging applied research in energy, water, and agriculture & food security. The $127 million United States Agency for International Development (USAID) funded project, in collaboration with the Higher Education Commission of Pakistan, was launched at Islamabad earlier in June this year. 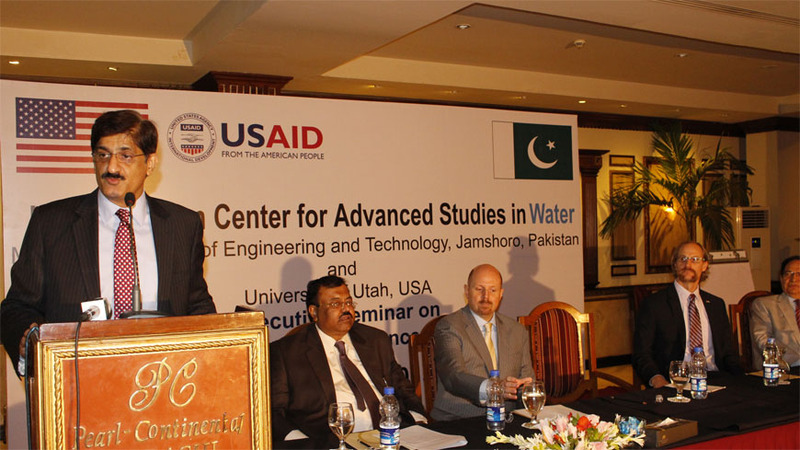 USPCAS-W has been established through a cooperative agreement between MUET and University of Utah. 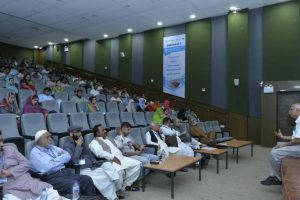 The Center will generate cost-effective and sustainable solutions to Pakistan’s challenges related to water and educating the next generation of scientists, engineers, and policy makers through innovative academic programs in water that are focused on applied research to solve Pakistan’s water problems. Speaking at the opening ceremony of the executive seminar U.S. Consul General Brian Heath said, “I would like to thank the Government of Sindh for supporting the Center for Advanced Studies in Water and for collaborating on aspects such as higher education and applied research in water-related disciplines, sharing of data and information, training on water sustainability issues, and organization of joint training events and workshops. I’m very proud that USAID is partnering in these efforts. We look forward to continuing to work with you in finding ways to deal with the problems you will discuss here today.” Dr. Randy Hatfield, USAID’s Senior Policy Advisor and Program Manager, Sindh Basic Education Program, was also present on the occasion. 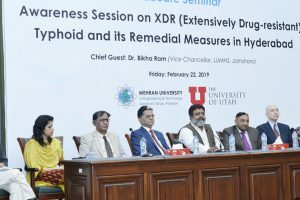 Speakers at the executive seminar were of the view that the available water resources in Pakistan are gradually shrinking, due to the prevailing water governance trends and consequently the storage capacity of water has also declined. They said that the present social, economic and administrative system of water management lacks to address the water challenges of Pakistan. They suggested that effective improvement of water governance in Pakistan is possible through the applied research, public-private partnership, improving institutional structure and informed decision making mechanism. Dr. Randy Hatfield, USAID’s Senior Policy Advisor and Program Manager, Sindh Basic Education Program, also participated in the Seminar. Vice Chancellor of MUET Dr. Mohammad Aslam Uqaili; Chief of Party, University of Utah, Dr. M. Aslam Chaudhry; Dr. Steve Burian, University of Utah; Federal Secretary for Climate Change, Arif Ahemd Khan; Chairman PCRWR, Dr. Muhammad Ashraf; Vice Chancellor, Sindh Agriculture University, Dr. Mujeeb-uddin Memon; Head of International Water Management Institute of Pakistan, Dr. Arif Anwar; Project Direct, USPCAS-W, Dr. Bakhshal Khan Lashari; Managing Director, SIDA, Babar Hussain Effendi; CEO, SPO, Naseer Memon; Project Coordinator WSIP, Dr. Fateh Muhammad Marri, spoke and shared their presentations regarding water governance strategies and research at the Executive Seminar on Water Governance in Pakistan.